It's so incredibly lovely! Well done! You both did an amazing job bringing this room to life! Jillian's room is absolutely adorable!! Every detail is so sweet and perfect for a little girl's room. Love the charm of it all! I just love Jillian's quilt and how wonderful you had some fabric to make the bunting. The room is so bright and inviting and will grow right along with her. The floors turned out beautiful. The room is so simplistic and pretty, as the rest of your home is. Jillian has to be so excited. What a pretty view she will have every morning as she wakes from her iron bed. What a lucky girl! Everything about the room is perfect. It is adorable. Love that the Snow White was found. Beautiful bedding and bed....everything is beautiful. What a beautifully charming room! I'm sure your daughter will enjoy it for a long time! Fabulous - your daughter is one lucky little girl! I have the same schoolhouse light and I installed new 5 panel doors too!! Love that you matched the look of the old house style. From the bed, to the plates above to the cute vintage touches to the wood floors and the corner reading nook - it all combines to be the perfect little girl's room! Totally sweet and charming ~ I love everything about it! The beautiful dresser is a nice contrast to the white walls too!! Gorgeous bedroom - I love the quilt and the painted wood walls. Well done. Andrea, you've created the most perfectly sweet and simple spot for her! Any little girl would be very lucky to have a room that beautiful! You did a fantastic job. What a beautiful girl's room! I love the name Jillian, by the way. I love that you left the door in its original state and I think the dark dresser looks perfect. Great contrast against the white ... it gives the room depth. And the bed and bedding is just yummy! So adorable, all of it! Truly a farmhouse bedroom. 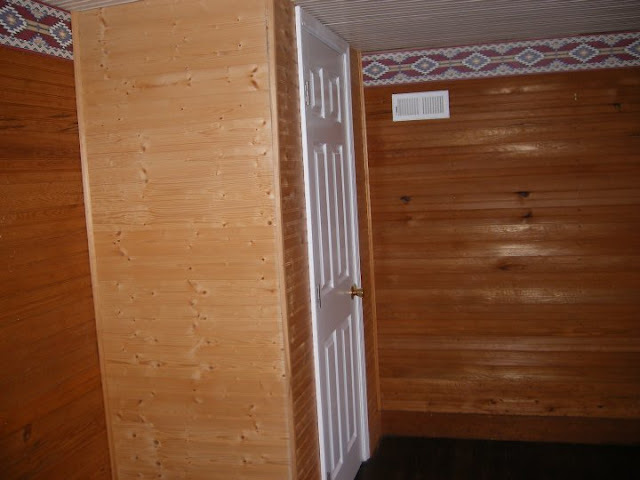 You couldn't recreate that old beadboard look with new products. I love the sweet simplicity of Jillian's room. And everything you've done to honor the history of your old house. What an adorable room, you did it just right!!! My gradma's farmhouse bedrooms looked like that with beadboard walls painted white, worn wood floors and braided rugs......old quilts, how homey and comfy!!! What a sweet little room! The floors are wonderful! What a charming room. I'd love to have it myself. Great job to you both. I just found your blog...wow amazing home, Can't wait to pour a cup of coffee and read all the post. Beautiful room. The reading nook is my favorite part, too! This is just wonderful--and so much work! When I was a little girl I longed to have a big window in an upstairs room. (I grew up in a 50s ranch...the grass is always greener, I guess :-) So clean and bright and pretty--just like your girl. Love her new room, so pretty!! Oh my goodness, you're right to be so excited about how this turned out! What a great space. And how incredible lucky you are to have those wood walls to work with - we don't see many (if at all) houses like that out here on the West Coast. And that quilt your mom made is fabulous, too - wow. This is absolutely amazing. You did a fabulous job. This a very inspirational post. I would love it if you would link this to our What’s It Wednesday blog party. Hope you can join us! This is so cute. I love every detail. What a lucky girl to have such a charming room. Thanks for sharing at Wow. Turned out great! Love the contrast of the white plank walls and the lovely dark floors. I love everything about this room! So fresh and simple, very charming. Oh my goodness this transformation is amazing! LOVE it! Her room is beautiful and has some great architectural features too. Love the quilt and bed from the Grandmothers. Great gift ideas for a little girl. My heart skipped a beat looking at the photos of Jillian's room! Amazing work you and your husband did, Andrea. Love all that painted beadboard and the lovely wood floors. And your decorating details are the icing on the cake! What a beautiful space for your little girl - everything is perfect from the wood floors to the painted planks to that sweet ticking curtain. Great job! Her room is just beautiful, Andrea. What amazing talent you and your husband have. Perfect for a sweet beauty like Jillian. Beautifully done! I love the walls, the floors and the bed. What a lucky girl to have such a great room. What a precious room! Jillian is a lucky girl! Thank you for sharing every lovely little detail! I enjoyed this post so much! Her room is very sweet and so lovely. I love how spacious and calm it feels. The view is great! Reminds me of staying at my Grandma's farm house when I was little. My what a can of white paint can do! It looks so bright and cheery and perfect for your darling little girl. I absolutely love what you've done. It looks amazing! I love it! So wish I could buy a quilt like that! How pretty! Lovely and cozy. Beautiful room! I love this look and you did an amazing job! Absolutely adorable! I love living in the country and her room oozes the simplicity of by-gone days! Love it! Your mother did a BEAUTIFUL job with the quilt and the bed fits so well! What a blessing...from both Grandmas! LOVE IT! Stopping by from Miss Mustard Seeds today. I must say you did a fabulous job redoing this room. Found you through MMS today as well. Your daughter's room is simply adorable, so feminine and sweet. Everything seems to have personal memories and that makes it even sweeter. Love the farmhouse theme too! I'll be helping with my 3 year old grand daughters big girl bedroom transformation soon. I'll keep your lovely ideas in mind! Oh my! Refinishing those floors was a genius move! I love the richness of the wood against the fresh palate of the rest of the room. And that reading nook is about as adorable as it gets. Good on you! Adorable girl's room!! Love all of the wood walls, floors, and ceiling. The bed is adorable too, and great idea to do the shelving. Love your old house. I cannot even tell you how wonderful this is. Are you posting a tutorial on the corner reading nook? Did I miss it? I am so inspired by your photography, too! and speaks farmhouse to me all over! Oh the love that a man has for his woman to pour his heart and soul into her old farmhouse. I love your daughter's room - such a beautiful and calm space. This is SUCH a cute room. You must have been so sick of painting white, but it was totally worth it. I love that you incorporated such little treasures into the room, like the antique Snow White. This is just the sweetest room ever! I love everything you have done. Those floors were worth every ounce of effort and those walls just can't be beat. It makes the room extra special to have a little touch from the important people in her life. The beautiful bedspread from grandma and the Snow White from grandpa, her fathers carpentry skills and of course your special touches. She will feel warm and loved every time she steps into that perfect room! a lovely sweet bedroom...wonderful job! What a sweet room you made for her! She will be very happy in that room for sure! What a pretty room with lots of farmhouse charm!! Bravo! What a treasure of a space to grow up in. How fabulous that you have that quilt and bed from her grandmothers. Your mom is an artist! Thanks for sharing your sweet redo of your daughter's room. I just love all the touches! OMG I love your daughter's room! It is absolutely fabulous. That Snow White is adorable too. Visiting from Kim's party and now your newest follower! What a lucky little girl to live in such a sweet room! Everything is lovely, from the colors to the little reading corner. Not to overdone, just simple, fresh and clean. You did a great job! I'm Visiting from Kim's party and am your newest follower and will be back often! Would love for you to visit me! I just discovered your blog and have to tell you that your daughter's room is so beautiful and serene! The quilt your mother made is breathtaking! The Snow White figurine is from the 1960's. Timex used to have a watch for little girls and they would come with Disney figurines. The memories made me smile. Your daughter's bedroom is perfection! I love that reading nook in the corner-such a great use of space. 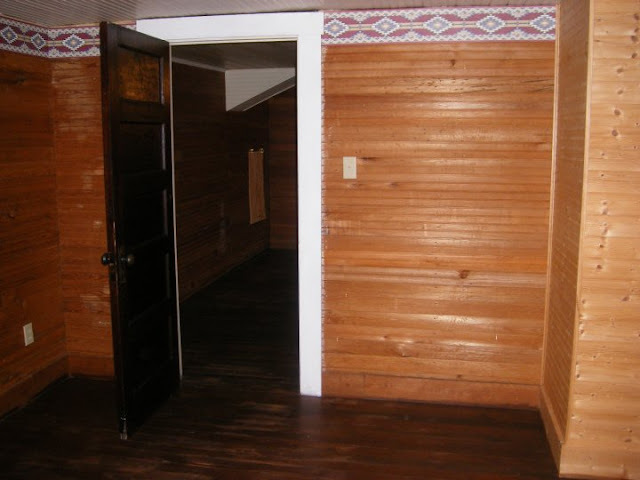 We have the exact same pine floors in our old house and they refinished beautifully. I love the fact that so many objects in her room come from family members. One day she'll treasure everything the way you do now. Your daughter's room is beautiful. I love the reading nook and the shelves. Your daughter's room is precious!! LOVE that your Mom redid the little girl picture that was yours! Also love the flooring!! GREAT decision!! The wood ceiling and walls look wonderful, as well as her bed and cover!!! The little reading area is very cute. Good job, your hubbie did!! Wonderful bedroom for a young girl to have and enjoy!! Just found you on WOW US Wednesday! Congratulations on being featured, well deserved! Wonderful bedroom! Everything is so sweet! The reading nook...the cover...that schoolhouse light...I love it all. Oh! I would love to find that Snow White to match with my vintage children's dishes an cups collection. This is so precious - absolutely perfect - every detail! What a beautiful transformation. I love your farmhouse/vintage style and the reading corner is so cute. The details enhance the charm. Great job! this is just a gorgeous room, all the details are just amazing, I love it. It will be featured tomorrow. Every little girl dreams of their space being a place they want to be in. 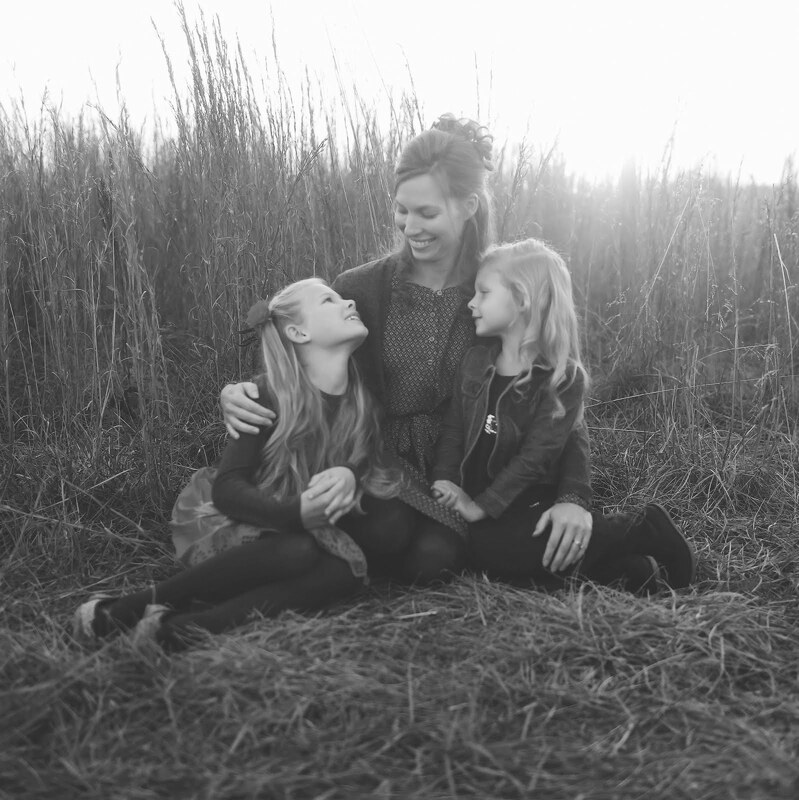 Those little girls grow up to be us moms who make those spaces for them. Your daughter's room is adorable. It reminds me of the house I grew up in. I swear I had that same door going into my room. Love the dark dresser with those gorgeous wood floors! Beautiful! I'm curious about the wood floors. Did you sand them with that sander? Was there a particular reason you didn't rent a sander for floors? We having flooring issues in our 1910 home. Thank you! We did use the sander you see in the picture, but I would not recommend it! It was very time consuming... next time around we would definitely rent a floor sander. I love the dark floors and white walls. I LOVE THE FLOOR! Love the white walls, light fixture, all the details...down to the orignal dark door. Most precious is that little cherub sitting in the corner reading books. The room really is so peaceful & cheerful----something straight out of a magazine. You definitely deserve that award you are up for! I hope you are chosen and some of this home is featured in that publication. Fantastic room. I wish I had your talent. Where is the bed from? So sorry, Stacy, I just saw your comment. The bed is from Pottery Barn Kids. I love the floors! Do you know what kind of wood it is and what color stain did you use? Thank you, Kelly... we really aren't positive what kind of wood the floors are, but that is its natural color... no stain!